Pour the light rum and coconut rum into a hurricane glass with ice. Almost fill it with pineapple juice. 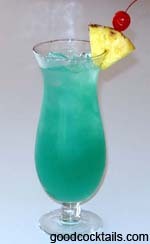 Add the blue curacao on top. You could also use a collins glass for this drink.